Save your wine and beer bottles: they could end up as wall decorations or serving platters at your next party. For nine years, Alexius Jones has been melting down glass bottles and creating artwork from the basement of her Oran home. Her one-person operation, I’m Melting…Glass, sells unique glass ornaments, cheese platters and other artwork. Jones began her creative stint working with fabrics and sewing when she was young. As an adult, she made wire creations in her free time before she switched over to glass melting for good. Never having any formal art training, Jones has perfected her craft through trial and error. Her best selling item, the cheese platter, is made from recycled glass bottles collected from friends, relatives, “dumpster diving” and her own consumption. “If I think a wine is worth buying, we’ll drink that and then I’ll melt down the bottle, but I’m not about to go out and buy all that Gray Goose,” Jones said. She gets the rest of the bottles from friends in all the right places: high-end bottles from waitresses at restaurants, a variety of beer bottles from a SUNY Cortland employee, and wine bottles from friendly wineries. Jones described the bottle melting process as a two-day event. First, the labels are peeled off and the bottles are washed and left to dry for a full day. The bottles are then placed in the two large kilns in her basement with decorative wire placed in the neck, where they are melted at approximately 1,500 degrees for five hours. Once cooled, Jones reattaches the labels to the bottom of the now-flattened bottle with a “secret” epoxy. A typical “batch” consists of twelve bottles. The finished cheese platters are sold with a cheese spreader for $20 to $25 each and can be used for serving or decoration. I’m Melting… Glass also features glass ornaments, suncatchers, wind chimes, candleholders and mobiles made from sheets of glass purchased from Camillus Stained Glass. These vary in price. Jones attends two craft shows each month from May through December throughout Central New York, were she sells most of her work. During a typical show, Jones will sell approximately 200 items. While it is Jones that creates the artwork, she credits some of her success to her husband, Don. “He’s such a good sport about it all, I really couldn’t do it without him,” she said. In addition to helping with the shows, Don acts as “dumpster diver” for new bottles, and repairman when the kilns needs fixing. It was also her husband that suggested she leave her job with the Leukemia and Lymphoma Society earlier this year to pursue her passion full time. While nervous about the transition at first, she said she has no regrets. “I find it rewarding to take an object and make something out of nothing,” Jones said. 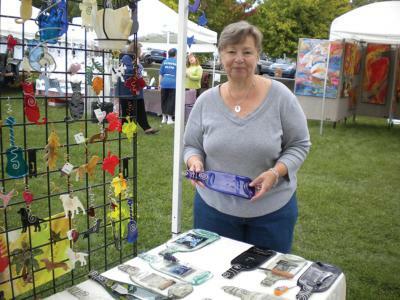 Alexius Jones pictured at one of the many craft and art shows she attends throughout the year. Check her calendar for a show near you!